Both Wi-Fi and email printing provide the option for secure document release at the printer. Full documentation is available in the resources section. A brief installation description is below. Install PrintMe Mobile software by downloading the trial software and entering the purchased licence number(s). An installation wizard simplifies the installation process. 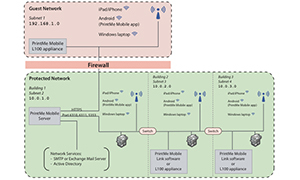 Install PrintMe Mobile software on a Windows system (or virtual machine) on the network that connects to the enterprise wireless network. If the network includes multiple wireless subnets, install and configure the PrintMe Mobile Link software. The L100 appliance is no longer available for purchase. Activate and publish PrintMe Mobile printers through the administrative dashboard. The printer drivers for the licenced printers must be installed on the system running PrintMe Mobile software. PrintMe Mobile allows administrators to publish any or all of the networked printers as Wi-Fi printers, make those printers available to mobile devices on any subnet, and control which users may print to which printers. The admin console even reports errors including low printer ink and offline printers. An EFI PrintMe Mobile driver is available for Windows 8, 7, Vista and XP laptop users, as well as Windows 8 tablet users. It provides automatic printer discovery and wireless printing to all PrintMe Mobile enabled printers. The driver is designed for silent installation. IT administrators may choose to deploy it using the push method with distribution applications such as Microsoft Systems Management Server (SMS). Learn more in the Driver Deployment Tech Note. The PrintMe Mobile administrative dashboard provides search, filters, tags, and data export/import capability to identify, configure, and check the status of hundreds of printers.